Eric Borgia, Executive Chef at MetLife Stadium, will feed over 80,000 fans this Sunday. Nonna Fusco’s Meatballs, based on a recipe from Borgia’s grandmother, are expected to be one of the most popular items on the menu. Borgia and a team of 200 cooks will man 30 kitchens to serve up more than 20,000 meatballs and 500 gallons of marinara sauce. This is how we like to make up a batch of Chicken Parmesan Meatballs here in the YVF Kitchen. Both the meatballs and the sauce are quick to make, and easy to scale up if you are cooking for a large crowd. Combine ground chicken, egg, spices, and Worcestershire sauce in a mixing bowl. Add 5 tbsp of the breadcrumbs. Gently stir until well blended. Don’t over mix or the mixture will start to get quite tacky and the meatballs will be tough. If the meatball mixture seems too wet (not wanting to bind together), add remaining 1 tbsp breadcrumbs. 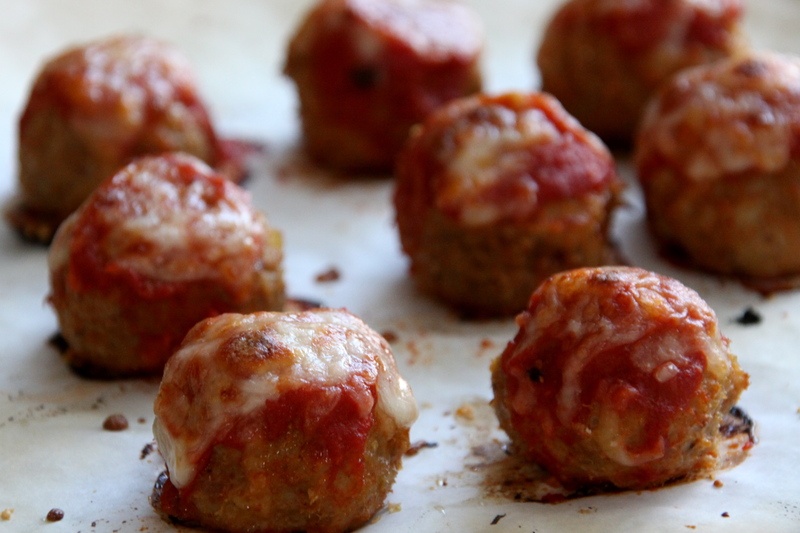 Form into ping-pong ball sized meatballs and place on a parchment paper-lined baking sheet. You may find it easier to roll the meatballs if you wet your hands first. Bake for 10 minutes. Remove from oven and spoon warm tomato sauce over top of each meatball. Sprinkle with a mixture of mozzarella and Parmesan cheese. Return to oven to bake for another 5 minutes. The meatballs should reach an internal temperature of 165°F (74°C). Turn the oven to broil for 1-2 minutes to fully melt the cheese. Serve alongside extra tomato sauce for dipping. Heat the olive oil over medium high heat. Add the red pepper flakes, salt and garlic. Sauté for about 1 minute, watching the garlic to ensure it does not brown. Stir in the tomatoes, lemon zest and cracked black pepper and heat to a gentle simmer. Allow to bubble away for a few minutes. Reduce heat and keep sauce warm until ready to serve. This entry was posted in Blog, Recipes and tagged #GameDayGrub, #YVFkitchen, 2014, Eric Borgia, meatball, MetLife, Nonna Fusco, Super Bowl. Bookmark the permalink.